Tart Cherry Ultra Gummies - Nature's Way®. 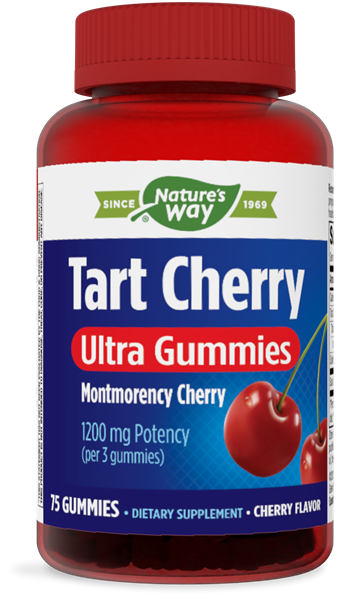 1200 mg Potency Montmorency (Tart) Cherry—in a delicious-tasting gummy form! Tart cherries are always in season with Tart Cherry Ultra Gummies! Contain tart cherry potency of 1200 mg per serving. Are made with only the preferred Montmorency Tart Cherry Variety. Have a delicious cherry flavor which comes directly from cherries—no added flavors, artificial colors or preservatives. Are sweetened with tapioca and cane sugars—NO high fructose corn syrup. Chew 3 gummies daily. If pregnant, nursing or taking any medications, consult a healthcare professional before use.